On April 17 there will be an important court hearing which will call for all charges to be dismissed against the UCLA 5—members of the Revolution Club arrested or charged for political speech, for participating in actions on campus while representing for revolution and politically protesting and organizing against the Trump/Pence fascist regime. This case is part of and marks an escalation in widespread attacks on the rights to protest and dissent, at a moment of consolidating fascism in this society. Members of the Revolution Club represent for revolution while learning more, and uphold, live by and fight for the Points of Attention for the Revolution. Humanity cries out for revolution, getting rid of this system of capitalism-imperialism at the soonest possible time. 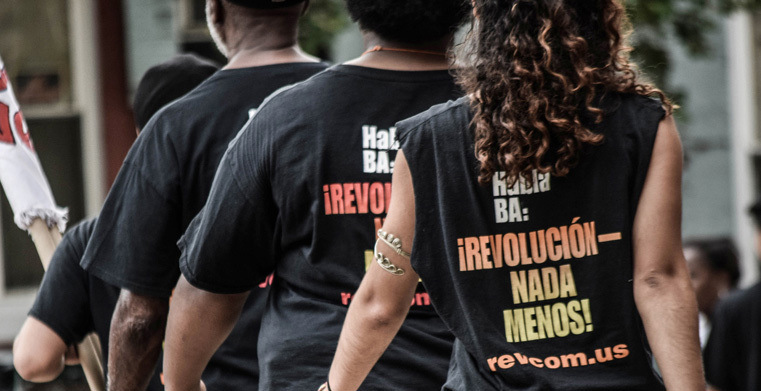 The Revolution Club is a key part of organizing a movement for an actual revolution, embodying the ethos and social relations of a radically different and far better society, without the white supremacy, misogyny, and American chauvinism of this society. The Revolution Club in Los Angeles includes UCLA students and alumni, and participates in the campus life at UCLA and other colleges as part of this. From this perspective, the Club has actively been part of the struggle against fascism as represented by the election of the Trump/Pence regime, uniting with other organizations like Refuse Fascism and others. 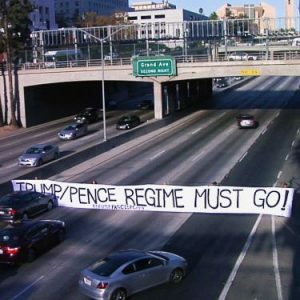 In a related but separate case, members of the Revolution Club and Refuse Fascism are facing charges from two nonviolent freeway protests from late 2017 where the protesters held signs and banners across the freeway demanding the Trump/Pence Regime Must Go! The fact that the Los Angeles city attorney filed ALL these charges against those arrested at UCLA and the two freeway protests several months later all at the same time reveals the political nature of the decision to file charges against all of them. All these cases being prosecuted by the city attorney are escalating attacks against righteous protest, dissent, and political speech—and for all people of conscience, the question is posed: Which Side Are You On! Demand ALL these charges be dropped against the UCLA 5 and the freeway protest cases. At a time where there is an existential threat to humanity and the planet, millions agonizing over what is happening and why this is happening—and with the possibility of a far different society being brought into being through an actual revolution—the criminalization and suppression of critical thinking and dissent is outrageous and unacceptable, and the right to radical and revolutionary ideas and organizing is essential and needs to be defended by all. These legal prosecutions and persecutions of the Revolution Club have far-reaching implications for students and society overall. What kind of speech and protest will be allowed? Will those who are searching for an understanding of the problems confronting humanity and the solutions to those problems be allowed to engage with various answers and programs, including especially from those who are identifying the source of these horrors as the system of capitalism-imperialism—and that what is needed is an actual revolution to end all this madness? Or will that be censored, suppressed, and even criminalized? What has emerged in documents turned over to the legal defense team (legal “discovery”) of the UCLA 5 case is a pattern of political surveillance and persecution by the University of California Police Department (UCPD). Campus police surveillance reports made public in discovery reveal detectives recording videos and taking photos of the Revolution Club on campus, with descriptions of completely lawful activities like “two subjects were wearing the black Revolution Club shirts and appeared to be approaching attendees of Bruin Day” (when prospective students are visiting the campus). Another surveillance report notes, “The three subjects eventually drove away without incident,” with a description of the car and its license plate number. Videos and photos turned over by the UCPD include those of club members protesting outside a program featuring anti-abortionist Kirstan Hawkins, and attending a program featuring Charlie Kirk, the founder of the fascist Turning Point USA which initiated Professor Watchlist to organize students to name and expose professors who encourage critical thinking and dissent. Chicago mayor Rahm Emanuel’s speech at UCLA was disrupted by protesters, including organizers from “No Cops Academy” and the Revolution Club. They called out Emanuel’s role in the cover-up of the Chicago PD’s murder of Laquan McDonald, a Black youth. Taking part in the National Call from Refuse Fascism for 11 Minutes of Silence in Support of 11 Million Undocumented Immigrants, which stretched across Bruin Walk. The criminal charges by the city attorney include participating in the 11 Minutes of Silence, even though they were not even arrested at the time. Waiting in line to attend an event with Chelsea Manning—yes, waiting in line. The prosecutor alleges that the members of the Revolution Club violated a ban on their being on campus, even though there was never any official notification of any such ban. Demand that the charges against the UCLA 5 be dropped immediately. Call or email LA City Attorney Michael Feuer’s office @ 213/978-8100 or mike.n.feuer@lacity.org. Pack the courtroom on April 17 at 8:30 a.m. in Dept. W90 at the Airport Courthouse, 11701 S. La Cienega, Los Angeles 90045, south of the 105 Freeway. UCLA students linking arms across Bruin Walk in response to a nationwide protest called by Refuse Fascism.